← Payback Time.No Free Lunches. The Reserve Bank of India (RBI) has sounded out large lenders and international bullion banks to strike `location swap’ deals to swap some of the old gold lying in RBI’s Nagpur vault since pre-Independence times -and whose quality is not exactly top grade -with purer gold.The move would ease the supply of gold, even if temporarily, in the local market where duty barriers have given rise to smuggling.This is the first time RBI will carry out such swaps. Better known as loco swaps in the global bullion market, it’s a mechanism whereby gold in one location is ‘swapped’, or exchanged, for gold in another location without physically shipping the yellow metal. Here’s how the proposed swap scheme between RBI and banks would work: RBI will give delivery of gold from its Nagpur vault to banks in India while taking delivery of gold from banks in London.But the gold that RBI would give to banks in India could be of a slightly inferior quality compared with the ‘London deliverable’ purer gold that it would receive from banks in London. The banks will deposit the gold in London in RBI’s account with Bank of England. 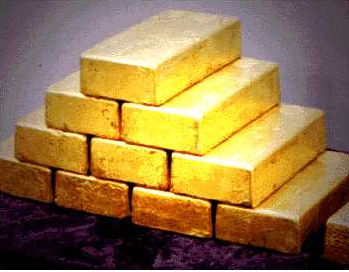 Gold accounts for $20.8 billion of India’s $315 billion forex reserves.Most of the gold is in Nagpur and some of it is parked with Bank of England where gold was shipped in ’91 to avert an economic crisis.Even though the gold lying abroad has long been freed of pledge, it was never necessary to physically ship the bullion to India. First, the swap will allow RBI to have more of liquid and highly tradable quality gold that will be held in London. Second, as it supplies gold to local banks it could increase the supply of gold in India without causing an immediate dollar outflow and straining the currency market.The bank that takes gold from RBI in India need not outright purchase gold in the international market for delivering the bullion to RBI in London. It’s possible for the bank concerned to borrow gold at the prevailing gold rate and postpone payment for eight to nine months. While it’s imperative for RBI to keep the current account deficit at a low level to which it has fallen now, the proposed move would also enable the monetary authority to achieve better earnings on its forex reserves. RBI can easily lend the standard London deliverable quality gold that the banks deliver. Of course a lot would depend on how much gold can be swapped and whether the swap arrangement catches on. Eighteen years after it had pledged gold, in 2009, RBI bought 200 tonnes of gold from the IMF – a development that took many by surprise.The present initiative, if it takes off, could go down as an innovative plan on forex reserve management.The development comes at a time when the government is under pressure to relax some of the gold import restrictions. India is the world’s largest gold importer.The country’s gold holding is almost equal to the total deposit base of the banking industry. Indian households’ high appetite for gold had been a challenge for the UPA government and may continue to be so for the present government.